This penthouse apartment in Manhattan’s SoHo neighbourhood is awash in natural light, with high ceilings, gleaming hardwood floors and a rooftop deck. The living room area includes a sofa in the rosy hue known as Millennial pink, the kitchen comes equipped with a floor-to-ceiling wine fridge, and the library nook is filled with books chosen for their appearance, not their contents. The white walls are spotless, and there is never any clutter. 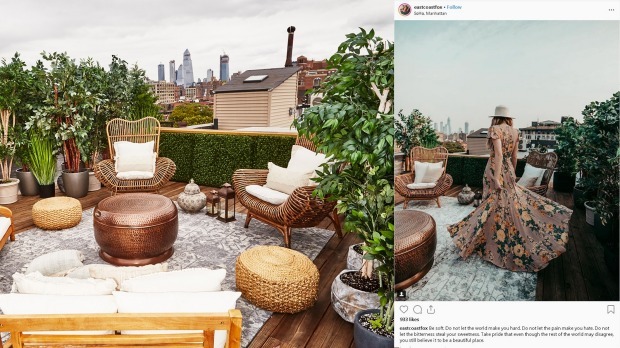 The 220-square-metre space – which rents for $US15,000 ($21,000) a month – was designed as a backdrop for Instagram stars, who have booked it through October. 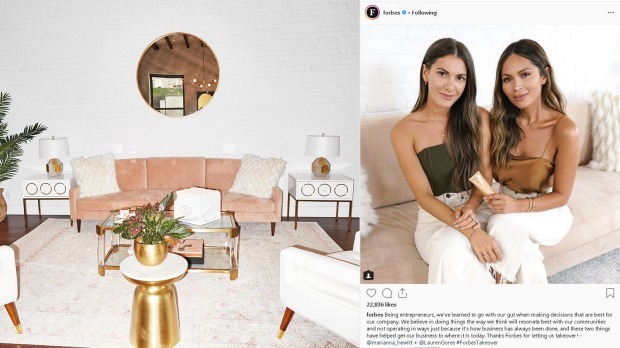 It was opened in August by Village Marketing, an agency that connects advertisers like the eyewear company Warby Parker and the Equinox fitness company to the social media personalities known as influencers. The ones who work with Village Marketing – mostly stylish young women who are paid to promote products on Instagram – have amassed huge followings with images that capture an idealised version of daily life. The Village Marketing team make sure there are a selection of Instagram worthy props such as baked goods and cheeses. Vickie Segar, the 35-year-old founder of Village Marketing, came up with the idea for an apartment tailored to social media after noticing that many influencers – especially those living in New York, with its cramped, dim living spaces – were having a hard time getting the shots they needed. Some were even booking hotel rooms or making covert visits to furniture stores to get their work done. Village Marketing, which has an all-women staff of 17, invited a number of social media stars to make use of the apartment in recent weeks, and their posts have already racked up tens of thousands of likes. The apartment points to a future where Instagram moves further away from a do-it-yourself aesthetic towards a look that is more staged and polished. 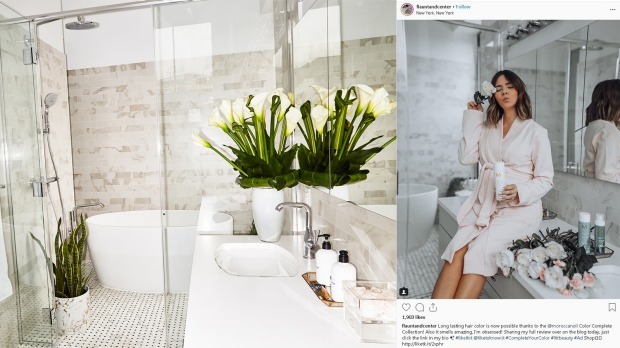 The bathroom has become a destination for influencers who promote beauty products. The apartment itself is something of an advertisement. It was furnished by the online furniture company Wayfair and designed by Wayfair Design Services in exchange for the inevitable social media impressions, Segar says. Village Marketing plans to eventually charge brands for installations and events in the space, so that it can remain free for those who reserve it for photo shoots. In fashion- and Instagram-speak, a moment is a certain look, rather than a unit of time. And so Segar describes the apartment’s library nook as “one of our favourite little moments”. She adds that the books on the shelves – with Crisis Economics just below Gone Girl – were chosen for their muted colours to make the area “not as feminine and peachy as the rest of the space”. Near the entrance is a spot that Segar describes as a “fireplace scene,” which is likely to be a hit among influencers during pumpkin spice season (also known as autumn). The chairs by the brick hearth have low backs, partly to avoid “anything reflective” from the mirror on the mantle. “When you think of all the products they’re trying to bring to life, they need as many moments and feelings as possible,” she says. Marianna Hewitt, who has more than 800,000 Instagram followers, recently took photos in the penthouse. Segar notes that the “huge windows” and “really iconic” wallpaper help make the bedroom Instagram-ready. The room has already yielded posts featuring a pillow fight and a bra ad. Village Marketing steams the pillows and sheets before every shoot. “There’s tons of pillows in the bed for them to work with,” Segar says, adding that different textures like velvet and fake fur photograph well. A serving tray with shiny accessories has already appeared in numerous breakfast-in-bed shots. 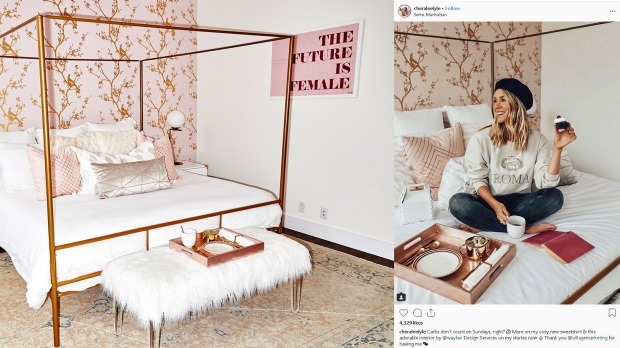 Another popular prop is the framed poster that says, “The Future is Female.” And the custom rug has figured in Instagram posts promoting footwear. “We wanted them to have something that would be able to feel like a moment where they could shoot their shoes,” Segar says. The rooftop deck allows for the staging of everything from yoga classes to dinner parties. Marianna Hewitt, who has more than 800,000 Instagram followers, recently took photos in the penthouse and hosted an event there for a skin care line she co-founded. “If you shoot in a traditional photography studio, it almost looks too good for social,” Hewitt says. At the same time, she adds, “we don’t want to shoot at our house every single day or the same streets we post on all the time”. Social media users like Hewitt like the apartment because it allows for images that have style, without the off-putting slickness of traditional advertising. The women who work with Village Marketing are drawn to the apartment’s “pink design moments and our iconic pink couch,” Segar says. The specific shade, she noted, is “Millennial pink,” which was also used for the chairs around the dining table. There is also the “rah-rah-Instagram-slash-feminist-wall,” an area filled with photographs of Instagram influencers and messages of female empowerment. The kitchen is a stranger to dirty dishes and splattered grease, but the Village Marketing team sometimes stocks it with baked goods or cheeses as props. Instagram-worthy vendors include Levain and Balthazar. During my visit, a batch of By Chloe cupcakes, with colourful frosting, lent a homey touch. The gold-accented dishes must be photo-ready at all times. “We needed a really white, well-lit kitchen that had enough space that you could back out and put a camera to video and film,” Segar says. Hanging on a nearby wall is a framed photo of Prada Marfa, the Italian fashion brand’s hut-like outpost in West Texas that has been the subject of countless Instagram posts. The roof deck allows for the staging of everything from yoga classes to dinner parties. And with a clever arrangement of the potted plants, the area can serve as a stand-in for “an outdoor space in the middle of the country,” Segar says. Hannah Bronfman, the 30-year-old founder of the women’s wellness website HB Fit, says the variety of looks provided by the apartment has eased the challenge of scouting locations for the various types of Instagram posts. The fact that the place was meant for social media, rather than real life, seems not to concern her.